Spinach and artichokes incorporated with a blend of cream cheese, garlic, and a whole lot of Parmesan! Serve it on top of sliced garlic toasted bread. Perfect for an exquisite dip to serve for your next gathering! The holiday season is still in full swing. Parties and gatherings are on the itinerary. At least it is at our house. Thanksgiving and Christmas are sadly over…but the celebration of the New Year is right around the corner! Also, my little man’s birthday soon after that. (My baby is going to be 7!!) Which means a big family party, WITH a ton of food! Always. So, when it comes to entertaining or bringing something for the whole crowd to eat, don’t you think a DIP is in order? 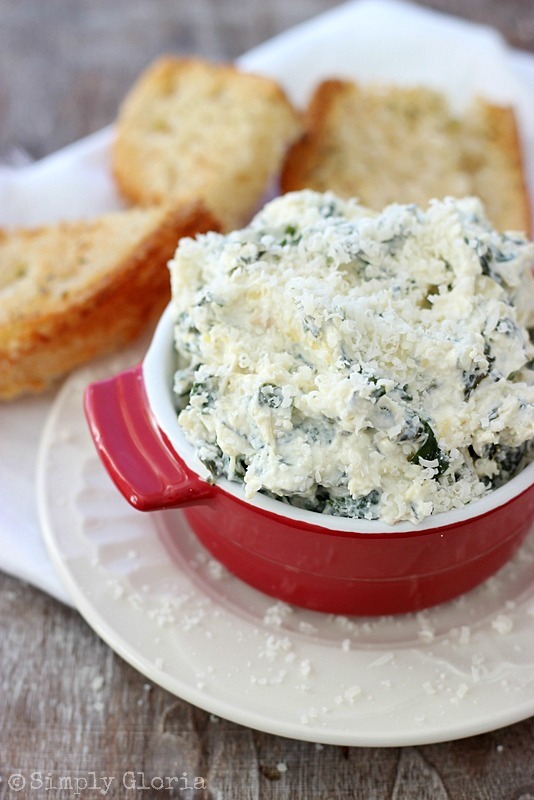 You’ve just got to love a great Spinach Artichoke Parmesan Dip, right? It has to have the equal amount of spinach and artichoke to compliment the creamy texture surrounding the flavors of garlic and Parmesan. After you’ve sliced the bread, smear it with some butter and garlic powder. Toast the slices under a broiler until lightly brown. Then surround the bowl of dip with the toasted slices! This dip takes very little time to put together. All you do is, put all of the ingredients together in a large mixing bowl and stir. One tip I really want to tell you, is about the spinach. If you are choosing to use the frozen spinach, which I do– allow it to thaw. Once the spinach has thawed all the way, put it into the center of about 5 (or more) paper towels. Squeeze out all of the moisture into the sink. You may even want to get a new set of dry paper towels just to make sure all of the liquid is out of the spinach. The best part is, it may be served hot or cold! Whatever your preference is . I really like it either way. Spinach and artichokes incorporated with a blend of cream cheese, garlic, and a whole lot of Parmesan! Serve it on top of sliced garlic toasted bread. Perfect for an exquisite dip to serve for your next gathering! Makes about 3 cups of dip. Store in a tight container for up to 4 days. 1 cup grated Parmesan, plus 1/2 cup for garnishing the top. Put all the ingredients in a large mixing bowl and stir. Sprinkle the remaining 1/2 cup Parmesan on top. If serving hot, put into a baking dish and bake in a preheated 350 degree oven for 20-30 minutes. Or until the center is heated and the Parmesan on top is slightly browned. Slice bread. 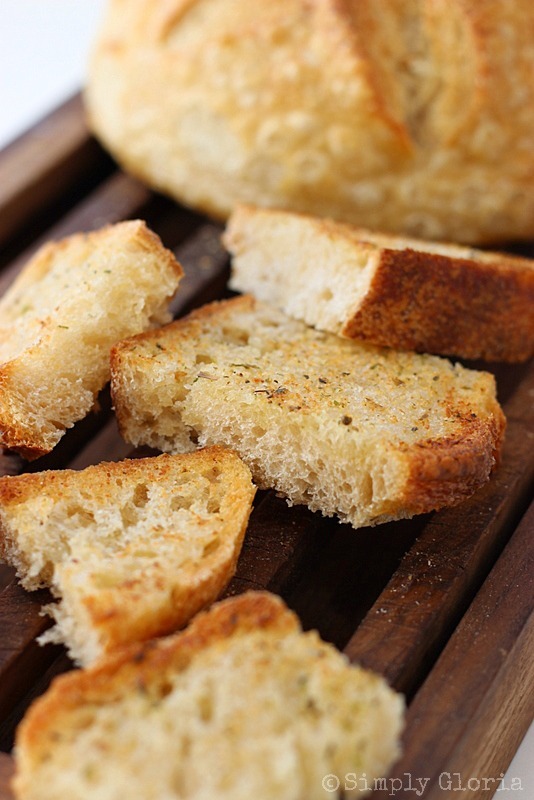 Spread butter and sprinkle garlic powder on top of slices. Put on a large baking sheet and broil until the tops are golden brown. We’re a dip family, too! Thank you so much, Renee! Oh, now this sounds so wonderful! And it will be perfect for those New Year’s Eve parties. Hope you have a great day! Dips are fun for parties…especially for NYE parties. Thank you, Heidi! Hope you have fun celebration next week! You’re so sweet, Eric! Looks like you got a really fun gift on Christmas… have a fun NYE! 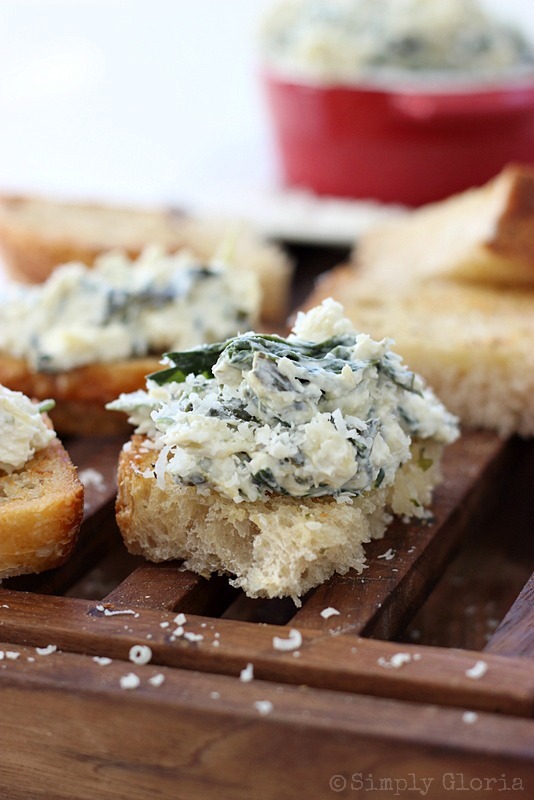 I can never resist a great spinach dip, Gloria — this looks heavenly! Gloria! I want this RIGHT NOW! I love dips, and this one sounds especially delicious. Thanks for the recipe, and Happy New Year! Andi @ The Weary Chef recently posted…Saturday Night Fever 14: A Recipe Link Party! Andi, I’ll trade you for your Super Easy Sour Cream Mexican Dip! This is one of my favorite dips to make and to eat! 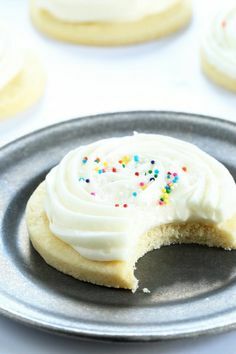 Perfect for a party- if I am willing to share! Pinning! You are always so thoughtful, Kelly! Big hugs to you! I’ve never tasted such a dip, and it looks sooooooooooooo appetizing!! I need to try it SOON ! Mmm. This is perfect, Gloria! 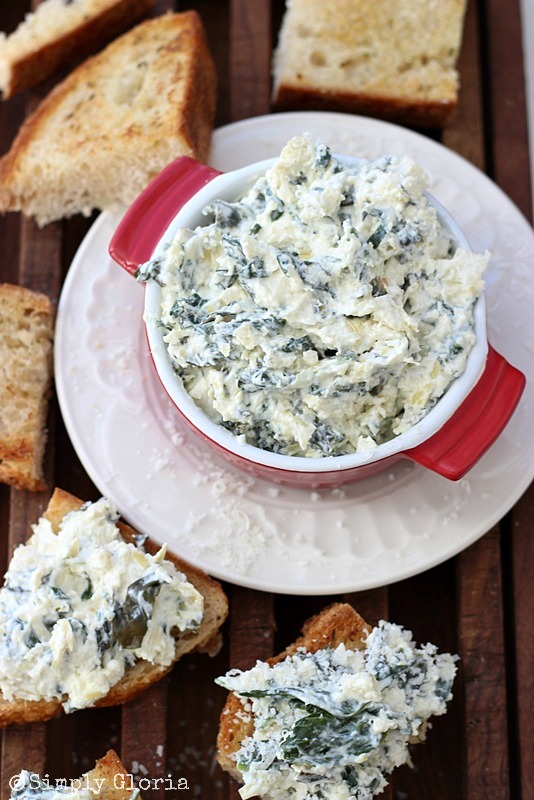 I love a good homemade spinach artichoke dip and I know yours is amazing! Thanks for sharing at MM. Featuring on Twitter and FB today. Have a lovely day, Gloria! Gloria, this is my favorite dip! So glad you shared at the MM party this week – pinning and your pictures are fantastic! Thank YOU, Deb! Always love to party with you gals! Whoa! That looks so dang good! I’m a sucker for dips and this one looks amazing. I’m the same way, Melanie. Put a dip in front of my face though, and I can’t stop! (I seriously have no self control!) Hope you had a great weekend …with what’s left of it! Love spinach dip! 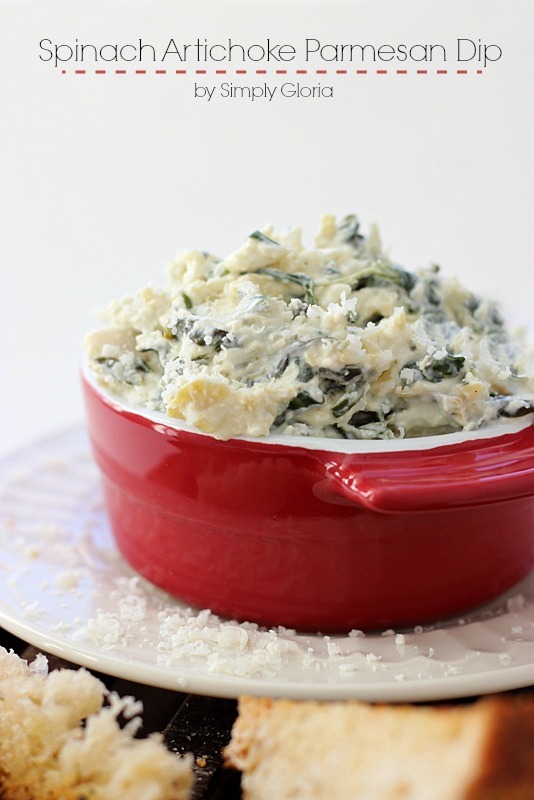 I love how you incorporated artichokes and parmesan into this dip as well! So yummy-looking. Pinned! This dip was SO awesome. It was a hit. I just added some cayenne pepper for a spicy kick.